Starts a stress test to load, draw more power and heat the device hardware. This can determine a range of hardware problems. 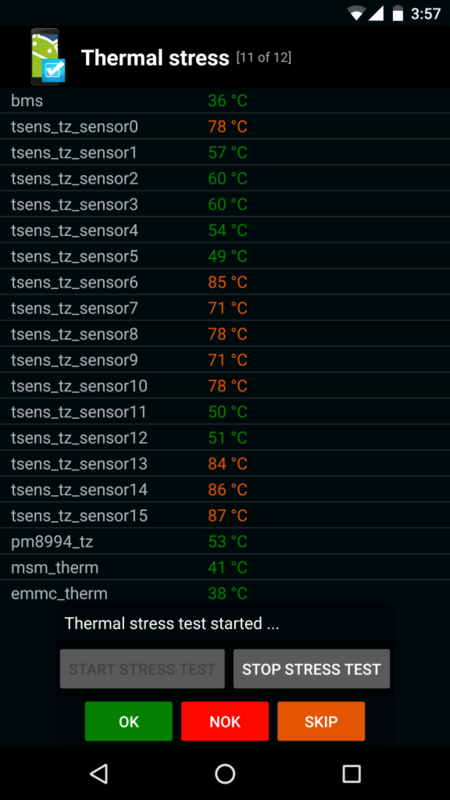 The test displays all detected temperature sensors and their current reading. A 1-minute stress test is started automatically and can be stopped and restarted at any time. Temperature sensors available on devices vary, examples are pa_therm0, pm8994_tz, pm8916_tz, and tsens_tz_sensor0. Generally speaking, the temperature sensors monitor temperatures in different zones and components of the device to ensure the device does not overheat. It does this by triggering a reduction in power to a circuit or throttling a clock to a lower frequency (e.g. reducing the CPU frequency). On a phone with a Qualcomm processor, the pa_therm0 temperature sensor is typically the heat sensor for the integrated power amplifier (pa) . This temperature sensor is used to modulate throughput and transmitting power. The more heat, the less through put and less power is allowed. The pm8916_tz, pm8941_tz, pm8994_tz are sensors from Qualcomm power management integrated circuits (PM8916, PM8941, PM8994) etc. The max170xx_battery is from the Maxim Integrated PMIC for battery management (e.g. Max17042 PMIC). See the Help – Notes page for more information about device temperature.